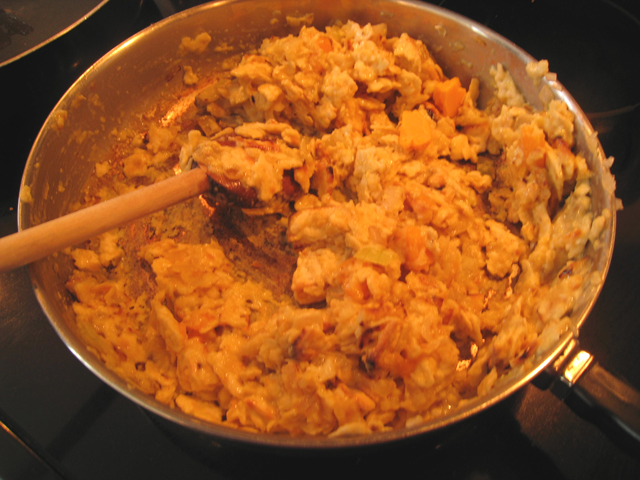 Matzo brei means fried matzo in Yiddish. 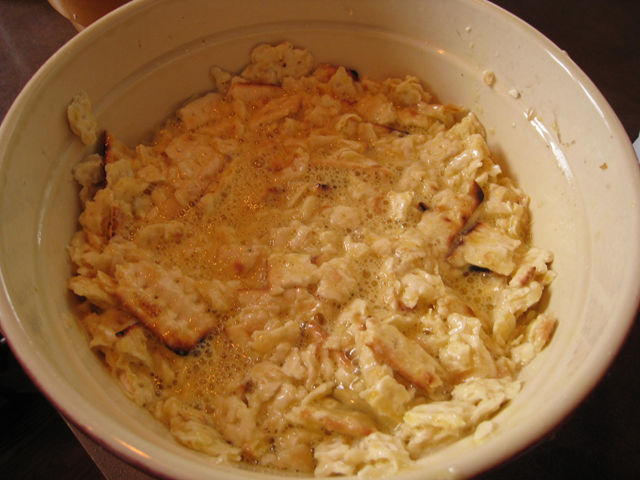 The traditional way to make it is with a lot of matzo – you generally use equal eggs to matzo. Jewish people eat it around Passover. Savory Matzo Brei is salty. 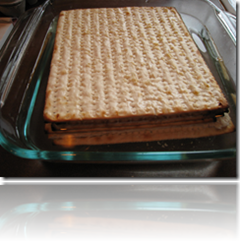 There’s a different recipe for Sweet Matzo Brei. You can put whatever you like into savory matzo brei. Here are some suggestions: fry up any of the following first: chopped onions, green or red peppers, mushrooms, or other vegetables that you might put into a normal omelet. 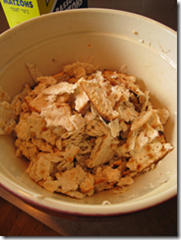 You can also add cheese and/or herbs to savory matzo brei. If you’re using cheese, I’d recommend Swiss or cheddar cheese – but use whatever you and your family like. 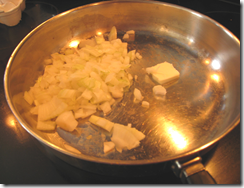 1) Fry up any vegetables you want to use in a little oil or butter, until lightly brown and soft. Set aside. 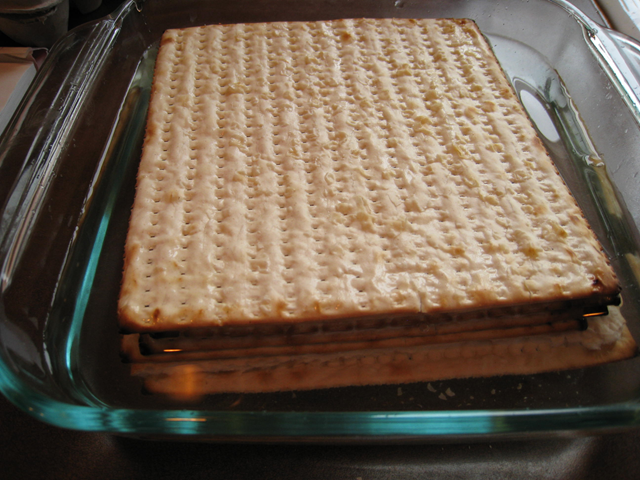 1) Soak matzo in water for a minute or two to soften (no longer than that). Take the matzo out of the water. 2) Break matzo into small pieces with your hands. 3) In a separate bowl, beat the eggs with the milk (like you would for scrambled eggs). Add salt and pepper and stir. Then stir the egg mixture in with the matzos. 4) Put pan with vegetables back on medium heat heat. Then add the egg mixture. Break up like you would scrambled eggs while frying. 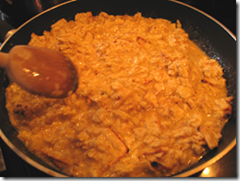 5) Add small cubes of cheese if you’re using cheese. When it’s firm (not liquidy), it’s ready to eat. 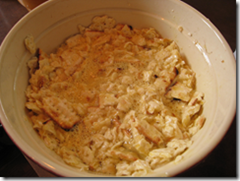 PS If you’d like to try something different, check out my recipe for Matzo Omelet. 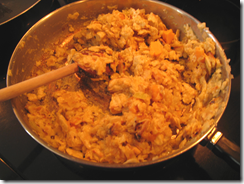 This article was posted on Wednesday, April 15th, 2009 at 6:18 pm	and is filed under Breakfast and Brunch, Countries & Cultures, Holidays Around the World, Israel, Languages, Main Course, Omelets, Passover, Recipes of the World, Savory Matzo Brei, USA, Yiddish. You can follow any responses to this entry through the RSS 2.0 feed. You can leave a response, or trackback from your own site. Thanks for sharing your Mom’s recipe! How do you make Khremslekh? I’d like to try it. I do not have a recipe myself. However, I have made it. I used a recipe printed on the box of Matse mel (Matzo meal). All I recall is that it included egg whites. Do try it.